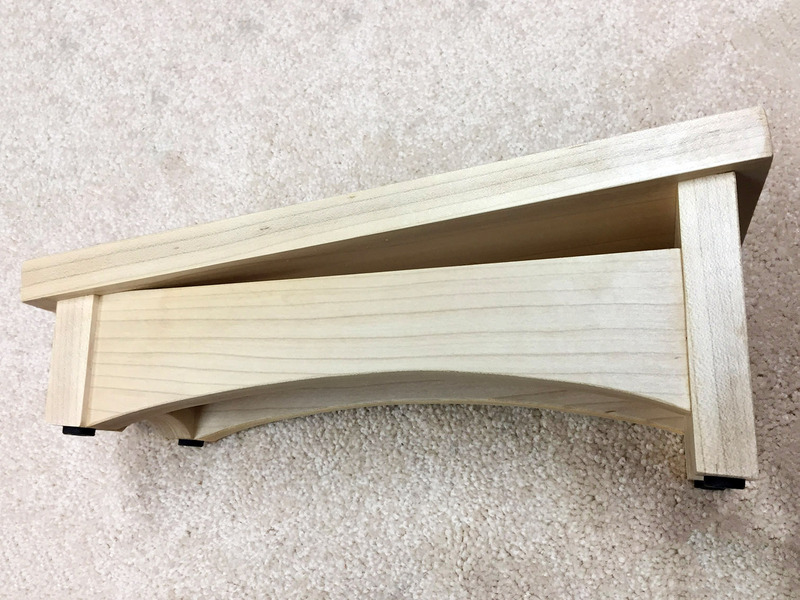 Each Classic Guitar Footstool is handcrafted using fine wood joinery techniques. There are no round wood plugs hiding nails or screws. Your prized guitar isn't nailed or screwed together and neither is The Classic Guitar Footstool. The foot platform is a comfortable 4 1/2" wide & 12" long and the base is equipped with four non-slip rubber feet. It is available in three heights: Low (5" at the toe & 3" at the heel), Medium (7" toe & 5" heel) and Tall (9" toe, 7" heel). Custom heights are available at an additional cost. Additional styles are presently under development. The base model of the Classic Guitar Footstool is available in Poplar or Oak construction. Custom builds using African Mahogany, Cedar, Cherry, Mahogany, Maple, Walnut, and other hardwoods and softwoods are available at an additional cost. Use the links which follow for additional images, pricing, and purchasing. Medium height model shown in oak construction. To order, for more info, or pricing. Low height model shown in maple construction. Medium height model shown in cherry construction. Self leveling neck rest makes guitar maintenance easier. Lute stand shown, built to suit customer's request. Contact for consulation and additional information. Quad in Claro Walnut with extra width shown.